Hi, I`m Florida. I am the bright green and yellow budgie in the picture. My friend, Dakota, is also in the picture. 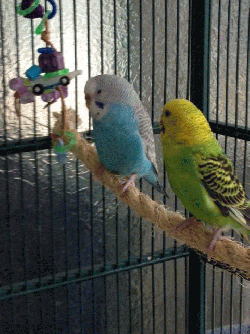 I was part of a flock of 32 budgies who were surrendered when their owner died. We all lived in an outdoor aviary, so I`m definitely not tame. But if you`ve got an aviary in need of a budgie (or 12), I`m your gal!